It is often said that all in the world wish for happiness, for themselves and for their loved ones. There is advice from Buddha to worldly people on finding happiness: live a life of virtue with loving kindness and caring for others. But, of course, such happiness never lasts indefinitely and so various states of grasping, clinging and attachment can arise, leading to negative actions that inevitably lead to suffering. How can we avoid those outcomes? In short, how can a Buddhist practitioner bring any experience of happiness in their lives onto their path? A teaching from the Great Collection of Mind Training Teachings (‘Lojong Gyatsa’ in Tibetan) entitled ‘The Mind Training of Taking Happiness and Suffering onto the Path’ provides instruction on how to respond positively to experiences of happiness so that we can be protected from falling back into negative samsaric habits. Firstly, there is an instruction on how to see the emptiness of one’s happiness; how to come to see that there is never any true existence to be found in any experience of happiness or the person experiencing it. Secondly, there is a special teaching for those on the Vajrayana path on how to identify experiences of happiness with their yidam, their meditational deity. For those who are not practising Vajrayana, the Lama explained that they can substitute the buddha nature in place of the meditational deity for this instruction. Thirdly, an essential third instruction is given for we ordinary men and women on how to dedicate our happiness for the benefit of all sentient beings. The Lama explained that if one can make this dedication process part of oneself, one will be cultivating the seed of nirmanakaya, becoming a buddha who works for others. With the attitude that you will dedicate to others whatever arises that is positive for you, then little by little, you will be growing into a buddha. The instruction for dealing with suffering when it arises is basically the same; and there is the same method given to Vajrayana practitioners to identify the appearing, though empty, experience with the yidam. So, indeed, we Buddhists can authentically open ourselves up to all experiences of happiness as well as suffering. But, what if we don’t manage to fully see the emptiness of our happiness at the time of its arising and so craving for its repetition arises? As well as reflecting on the insubstantiality of the faded happiness, one could also turn to the instructions on how to transform the negative emotions of attachment and craving. In this way, all such experiences we can have in life are anticipated and covered by the mind training. So as ordinary trainee bodhisattvas, we do not need to fear the world. We may not yet have escaped from samsara’s clutches, but we can face it with humour and a good heart, knowing that there is, for us, a path with power to liberate all. This blog is the work of students of the Dechen Dharma Community. Posts are typically a result of contemplation by its authors on teachings given by their Lamas. Whilst every effort is made to accurately reflect teachings given, any misrepresentation is entirely the responsibility of the authors. Please address any communication to blog@dechen.org. 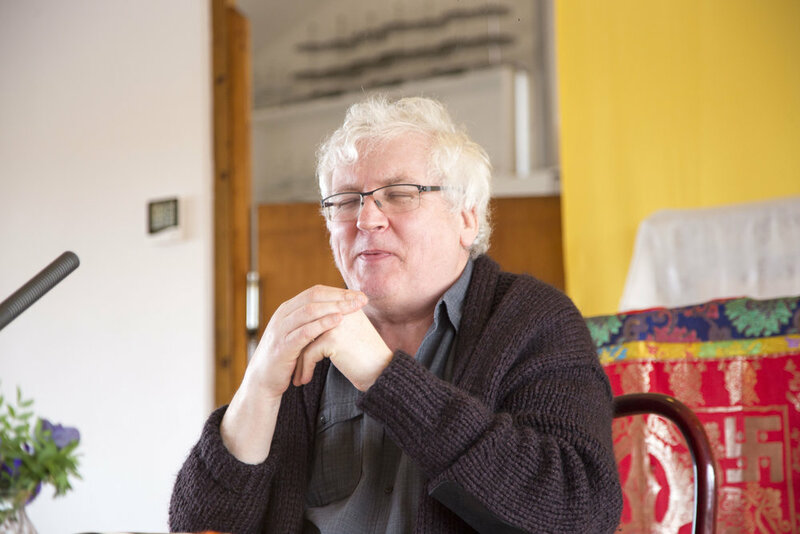 In early March this year, Lama Jampa continued his teaching from the ‘Great Collection of Mind Training Teachings’ (‘Lojong Gyatsa’ in Tibetan). This anthology of individual teachings by a range of different masters spanning over five centuries was originally compiled by two Tibetan masters, Shonu Gyalchok and Konchok Gyaltsen in the 15th Century. Last year in London, students were introduced to the principles of ‘mind training’ (lojong in Tibetan) from the text ‘The Eight Verses of Mind Training’. See our earlier blog on this together with a link to a recording of that teaching. This recent teaching was about what we do about strong emotions that we normally think of as obstructing spiritual progress. Amazingly, in this system of lojong, these emotions, which have up to now enslaved us in self cherishing, become the very fuel of our practice. It is true that disturbing emotions such as desire, pride, jealousy, hatred and delusion have always been factors that alienate us from our true nature, our buddha nature. So, one may think that they are to be somehow pushed away or denied. However, that is not the approach that is adopted in the lojong. Here, they are not to be denied, but equally they are not to be indulged. By falling prey to them, we give in to habits of unskilful actions, perpetuating karma that keeps us enmeshed in sufferings of samsara. The lojong approach is first to acknowledge that these universal emotions inevitably arise in our minds, in our experience of life. It is what we do next that is so radically different from anything we have done before. In the lojong, we use the experience of whatever emotion that has arisen to draw in the common experience of others, of that emotion and its attendant suffering. We cease to see the arisen emotion as being particular to ourselves. It is a universal that others experience and so we can use its momentary arising as revealing a bond between ourselves and others; a connection that otherwise would not have been seen as positive at all. The example is given in the text of desire. In the particular example given, we train so that on the arisal of desire, we firstly bring to mind someone who we feel is antagonistic to us. Then, acknowledging the fact that sometimes they must experience desire, we draw this imagined desire (without giving it any specific form) into our mind to merge with our desire. We then extend this by bringing others to mind and drawing in imagined desire from them also. In this way, we grow a great heap of desire in our mind so that it is no longer just ours alone. Now, we have taken our desire in a completely different direction from the route of self-cherishing that has so entrapped us in samsara. Instead, we have taken it on a completely different route: towards bodhichitta. From this we see that lojong, this training that we are undertaking privately within our own mind, is not a path of cool detachment at all, but one of developing an inner sense of connectedness with others. To learn to practise this teaching properly, of course one needs to do much more than just read a brief blog post like this. One must attend teachings by a qualified dharma teacher to receive the full body of instructions and explanations necessary to embark on the training properly. Fortunately, that is perfectly possible for us, as Lama Jampa is just such a qualified teacher and he gives these teachings regularly at his Dechen centres and also at other centres around the world. See the events page of this website for details of the former and the Lama’s website for details of teachings he will be giving in other places. He will be presenting further teachings from the ‘Great Collection of Mind Training Teachings’ in London in the Autumn. With unsurpassed insight into the workings of the world, flowing from his enlightenment, Buddha is uniquely able to guide us on how we can find success and happiness in our lives. The guidance is not restricted to those who have made commitments to transcendental paths as represented in the Sravaka, Theravada and Mahayana paths (where ‘transcendental’ refers to that beyond the scope of ordinary worldly success and happiness sought in this life). There is a body of advice derived from Buddha’s teachings that is freely available for those whose aims and ambitions in life remain entirely worldly. For those who have looked to dharma for guidance, since the time of the Buddha until now, motivations have varied widely from the worldly to the purely transcendental. These differences were delineated by the Indian master Atisha, in 11th Century Tibet, into a classification of three kinds of motivation: worldly, individual liberation from samsara, and attainment of enlightenment for the benefit of beings. Chogyal Phakpa used Atisha’s classification of people’s motivations to present advice to a Mongol prince in the 14th century. We today have at least one thing in common with that historic prince: we seek lasting happiness! So, let us see what this ancient text may have to offer, not just for our own benefit if we are already Buddhists, but for others in our lives who may not be. In January, Lama Jampa taught the first part of Phakpa ‘s text, this section of which is a presentation of Buddha’s Worldly Path. This is a path for the ordinary person who is not seeking liberation from cyclical existence, samsara, as taught in the transcendental paths. This is not to say that such a worldly motivated individual will not subsequently develop a deeper and more subtle motivation upon glimpsing the nature of samsaric existence. In fact, Phakpa’s text anticipates just such a progression, as the second and third sections of his text, to be taught by Lama Jampa later in 2019, deal with the Hinayana and Mahayana paths respectively. The cause of happiness is virtue and not wealth. So, one should cultivate the values that accord with that understanding to achieve happiness. This is not to say, however, that wealth does not play a part as one needs some degree of wealth to protect and benefit others. Used properly, wealth can be of great benefit. One is advised to develop a healthy attitude towards wealth, recognising that it is a temporary phenomenon. Then, if one loses one’s wealth one will not become dejected but go to work to create whatever is positive. Loving Kindness is a cornerstone of the whole Buddhist Path. Here one is encouraged to recall with gratitude the kindness of one’s parents who gave us our body and cared for us until able to stand on our own two feet. Feeling part of a continuity of family that stretches back over time counters the arrogance one could develop from thinking of oneself proudly as an independent entity. The sense of gratitude that flows from this kind of attitude naturally leads to a wish to repay kindness by looking after those for whom we have responsibility. Regarding protection of others, Phakpa lists particular people who we should certainly look out for and protect: the elderly, the poor, the sick, one’s partner, one’s children and, he says, those relatives who do not deceive one. Also, anyone who you have harmed and who showed patience is worthy of your protection, as are people who we may otherwise have condemned for making silly mistakes. He says that those who don’t care for others won’t achieve their own benefit. It is not just the vulnerable who Phakpa advises us to include in our circle of protection. He points to benefits for the worldly person in providing protection for spiritual beings who benefit others. This provides a connection between us and their powerful virtuous deeds. Recognisable signs of wisdom, kindness and compassion are qualities that make a person worthy of support and protection in that way. To exercise control effectively in all directions is surely something we would all wish to be able to accomplish. This can be achieved, Phakpa says, with the right kind of effort. Firstly, we try to align ourselves with virtues that are in harmony with life. Then, we need to develop a determined energy that is ready to face difficulties and obstacles that will inevitably arise. He points out that no benefits happen accidentally and all those who achieved anything great only did so by applying themselves. Rule According to Dharma because dharma brings happiness to the world. The relevance of this advice to how we fulfil our own responsibilities - whether as leader, manager, parent or modern-day consumer - can easily be seen. We are advised to avoid quick worldly fixes or shortcuts that rely on manipulating others. Develop an inner ambition of kind heartedness to others, wanting happiness for those working for us, acknowledging their work and contributions. We are encouraged to recognise that no-one in this world is either wholly good or wholly bad; all are mixed. So, when virtue outweighs the bad, recognise that as a good start! The first kind listed here is like an enemy because after all the difficulties of acquiring, accumulating and trying to keep it, it destroys you. Meaningless wealth is wealth that is obtained easily but that is not spent or put to any beneficial purpose. On the other hand, wealth that is likened to a relative is obtained by honest means, accumulated without effort and used for beneficial purposes with a virtuous mind. Finally, ordinary wealth is what is needed to provide the temporary benefits needed by oneself and those under one’s protection. Wealth like a relative is clearly beneficial and ordinary wealth is common sense, whereas the other two kinds of wealth are to be avoided. To accomplish activities well, the wise man or woman examines an action before committing it, whereas the foolish one acts and then sees what they have done afterwards. Even if actions don’t turn out as the wise man or woman wished them to, they will have no regrets, whereas the foolish one will have every reason for regrets. Phakpa says one should always apply this kind of wisdom to one’s actions. When it comes to food and intoxicants, we are advised to take care and with regard to sexual pleasure, to avoid distracting attachment to it. Rather we should rely on contentment. Phakpa said to the prince that by following this advice, he would become glorious and prosperous in during his life and acquire happiness in his next life, having gained merit in his own lifetime. Many of us will immediately see the sense of this pragmatic advice and wish to apply it in our own lives, seeing that this is the only reliable way to happiness even in this modern world. Lama Jampa will move on to the second part of Phakpa’s text in early June. Find details here. This next part will show how the dharma student who is motivated towards liberation from samsaric existence builds upon the foundations laid in this first section which has outlined the moral outlook that remains indispensable throughout the Buddhist path. .